If you’re Jewish I think I know what you’re thinking. “Oh yeah thanks Emma. Today is the last day of Pesach. 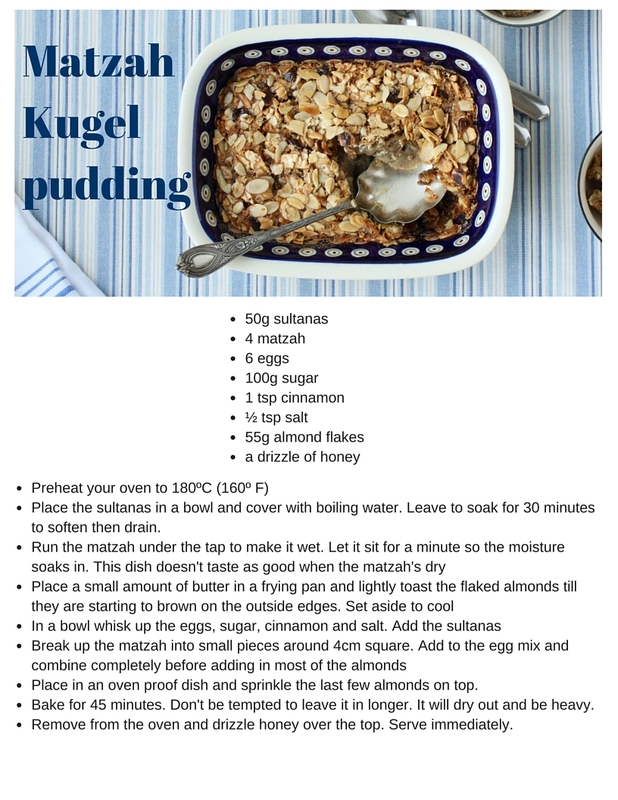 Great timing for a Matzah Kugel Pudding!” and I get it. This recipe would have been a whole lot more helpful if it had gone out last week when Pesach – the Jewish passover started. But I hadn’t perfected it then and I don’t want to share anything with you that isn’t just right. Also I had so many downloads this year on the first two days of Pesach for the cinnamon balls biscuits and almond macaroons that I know you’ll love this recipe next year anyway! This is a basic matzabrai recipe – matzahbrai is an eggy breakfast we eat during Pesach. I love it and eat it all year round for lunch. The key to this recipe is to keep the egg soft and moist. The Matzah Kugel Pudding can become dry and therefore really stodgy really quickly so if there’s a bit of movement when it’s time to take the Kugel out of the oven that’s just fine. I added a whole load of almond flakes to this recipe as I’m a bit addicted to them at the moment and lets face it this is the perfect time of year to fill up on almonds – basically all the cakes made at Peseach use almonds in one form or another. Almonds make it really tasty. I also add a drizzle of honey on the whole pudding when it comes out of the oven. If you eat it then it tastes divine but if you come back to it the next day and nuke it in the microwave the honey just seeps in. Deelish! You can of course make this pudding anytime of year but during Pesach when food gets a little bit limited it’s a real treat. Definitely one to make every year along with the cinnamon balls and almond macaroons. I feel a new family tradition coming along! I am a massive date fan. I have them with a cup of tea at the end of the day (instead of another slice of cake or cookie) and the really soft, gooey medjol ones are my favorites. But when you get a regular pack and they’re all a bit hard I bake with them. By soaking the dates in boiling water they get really soft. You can leave them to cool for half an hour and they’re perfectly ready but to make them really moist for your cake leave them over night in an air tight container and give them a shake every now and then. I didn’t used to like walnuts but over the years they’ve been growing on me. I don’t like it when you can’t taste them in a cake so I often just quarter them so the pieces are big and chunky but you can chop them smaller if you prefer. Toasting them (or baking them in the oven) makes all the difference. It’s like you’re sealing the flavour in. Definitely worth the effort. FAQ: What size eggs should I use for baking? What size eggs should I use for baking? ….is a question that I’ve been asked quite a few times – and have since made sure I remember to include that detail in my recipes. I’ve used both medium and large eggs in my cakes. I used to think that larger eggs would make lighter cakes – which it can do for an 8″ cake, but as the cake sizes get bigger and the quantity of egg increases there’s a point when the cake will be ruined. You see the difference in egg sizes will produce different weights. And that’s where the problems start. So, substituting one large egg for a medium won’t make much of a difference but if your recipe calls for 8 medium eggs and you only have large it will be the equivalent of 10 medium eggs! Check out the sizes below. All eggs are at risk of carrying salmonella bacteria inside their shells and that risk is dramatically reduced if shop bought eggs are stored in the fridge at 4ºC or below. For that reason never use damaged or cracked eggs. Discard them immediately. Eggs should be stored in the fridge until needed then they should be allowed to come to room temperature for an hour before baking. The reason for this is that eggs won’t whisk up if they’re cold – it’s due to the temperature of the air inside they egg whites. They need to be warm enough to easily expand. The whites of an egg is what gives a cake structure and with less air bubbles due to cold eggs you’ll have a less stable cake. Maybe that’s why cakes sink in the middle!?! The easiest way to check the freshness of an egg is to place it in a glass of water. If it sinks it’s fresh. If it floats it’s not and bye bye egg. If egg whites are full of protein and add lightness to a cake it’s the yolk that keeps it moist. The yolk is the fat part of an egg and will prevent the protein whites from whisking – hence it’s essential to have absolutely no yolk in your whites when making meringues. It’s also why I add an extra egg yolk to gluten free cakes when they need extra moisture. The answer is always medium. A lot of the time a cake will need equal quantities of egg, sugar and flour as a base to start from. For a perfectly balanced cake weigh your eggs (once out of the shell) and then use exactly the same amount of the dry ingredients and see how your Victoria sponge improves! I really hope that has been helpful. I have to say that when I was looking for facts about eggs I discovered this post on Chasing Delicious which is totally fantastic – as well as gorgeous to look at. Check it out if you want real depth and knowledge about eggs and baking. Comments Off on FAQ: What size eggs should I use for baking?